This power amp is the perfect companion for our PLL transmitter and any other 500mW to 1W transmitter. The large RF gain provides a massive power boost of around 14dB (25 times !!!!). Unlike other power amps on the market, this unit is supplied complete with heatsink fully built and tested. The 100-240V AC model will operate on any mains power supply in the world. Just hook up the power amp to your antenna, transmitter drive and power supply. Never take off the lid, no tuning needed, no test equipment required. This unit is truly plug and play. The power amp will remain very stable under severe load mismatch conditions. Harmonics and spurious are below -50dB making the amp compatible with most countries licensing conditions. 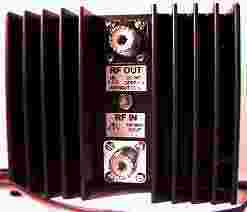 The power amp is suitable for RSL stations in the UK. The circuit design uses discrete transistors, not an RF module. This ensures that any replacement parts will always be readily available. Careful design of the RF output stage matching provides very efficient DC to RF conversion allowing the amp to run just warm in nearly all environments without an additional fan. This efficiency will give the power amp long life and reliability. This power amp is the perfect companion for our PLL transmitter and any other 1W transmitter. The large RF gain provides a ample power boost of around 11dB (12 times !!!!). The circuit design uses discrete transistors, not an RF module. This ensures that any replacement parts will always be readily available. Careful design of the RF output stage matching provides very efficient DC to RF conversion allowing the amp to run cool in nearly all environments without an additional fan. This efficiency will give the power amp long life and reliability. This power amp is primarily designed for use with our 5W transmitter, however there is no reason why it cannot be used with any other 5W driver that will operate into 50 ohm termination. In an open environment the RF power increase from 5W to 30W will improve the range by about 2.5 times. The whole power amp unit comes ready to use ' plug and play ' on delivery. Just hook the power amp to your antenna, transmitter drive and 13.8v (4.5 amp continuous) power supply and that's it, you're on..
Test equipment is not required to set up and operate this amp. The output stage delivers a minimum of 30W into a 50 ohm antenna/dummy load from 88 to 108MHz without ever having to take off the lid to carry out any tuning or tweaking. High SWR conditions will not drive the amp unstable and furthermore the amplifier will not self oscillate without RF input drive or connection while the DC power is applied. Harmonics and spurious are below -50dB making the amp compatible with most countries licensing conditions. The circuit design uses a very robust single stage discrete transistor, not an RF module. Our research shows that replacement output transistors, in the unlikely event they are needed, will be available for many years into the future. Heatsink temperature on the amp is typ warm/hot and will operate 24 hours a day in most of worlds countries without an additional cooling fan. This power amplifier is designed to be used with our 12-Watt Variable power transmitter, or 12-Watt Power amplifier. As with all our power amplifiers this unit is completely broadband and does not require any tuning by the user. Power supply requirements are easy to fulfil, being 13.8V @ 6 Amps, which can be provided by a mains power supply or vehicle battery. The front panel LEDs indicate at a glance the presence of DC, RF input and RF output. When RF input is absent the DC to the Power amplifier shuts down automatically, conserving power. This robust unit is protected from DC over-current using a high powered mosfet and will never consume more than 5.75 Amps, regardless of drive level or SWR mismatch, e.g. in the event of Antenna failure. Thanks to the integrated fan cooling system, this unit can run cool, even demanding applications, that require 24/7 operation. On delivery the equipment is ready to plug in and use with any suitable 50 Ohm antenna system such as our Vertical 5/8 Wave, Single Dipole or Stacked Dipole. Based on our extensive experience of broadband power amplifiers this unit will produce 100 Watts 24 hours a day at any single frequency from 87.5 to 108 MHz. The power amp will never have be returned or sent to a specialist for a re-tune if a frequency change is required. The 100W power amp is available as a 13.8V DC unit requiring around 12 amps. This is most useful for remote sites that use heavy duty vehicle batteries as back up. There is also an high quality mains power supply available to accompany this power amp. The mains power supply has a solid 13.8V DC output capable of providing an additional continuous 4 amps to power a driver transmitter or power amp of 20/25W. For maximum reliability and system redundancy the 100W power amp is designed around two rugged 50W broadband power amps paralleled together using a broadband susceptance compensated Wilkinson combiner. In the unlikely event of a 50W power amp module developing a fault the other 50W power amp will continue to run keeping the station on air. This is of great benefit to stations that carry advertisements and cannot afford a shut down at any time. The 100W power amp is designed to be stacked easily. For example, stacking two 100W power amps with two stacked dipoles will give about 500W EIRP or stacking four 100W power amps with four stacked dipoles will give about 2000W EIRP. To make the 100W PA as compatible as possible with our existing power amps and transmitter/drives the 100W power amp has been designed to take the following drive levels 25W or 30W, this drive level needs to be stated on ordering. Test results @ 13.8VDC, 50 Ohm Load, Bird Thruline Power Meter. No trace of ANY signal measured at 0.5F, 1.5F or 2.5F.